Scott John­son of Pow­er­line (“Why We Dropped the Bomb,” 13 April) kind­ly links an old col­umn of his quot­ing an old one of mine with ref­er­ence to Pres­i­dent Obama’s vis­it to Hiroshi­ma and the atom bomb­ing of Japan. 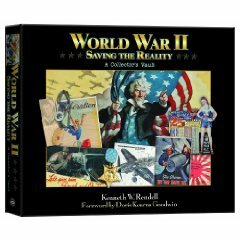 World War II: Sav­ing the Real­i­ty, A Collector’s Vault, by Ken­neth W. Ren­dell. Whit­man Pub­lish­ing, hard­bound, slip-cased, 144 pages, pro­fuse­ly illus­trat­ed in col­or with 80 repli­cas, $49.95, $32.97 from Ama­zon. Here is the most indis­pens­able guide ever cre­at­ed to the war that made us what we are today. From teenagers to vet­er­ans, read­ers will be enthralled with this portable ver­sion of Ken Rendell’s Muse­um of World War II: that inim­itable col­lec­tion of wartime mem­o­ra­bil­ia, doc­u­ments, per­son­al effects and auto­graphs housed in an unla­beled build­ing in sub­ur­ban Boston.